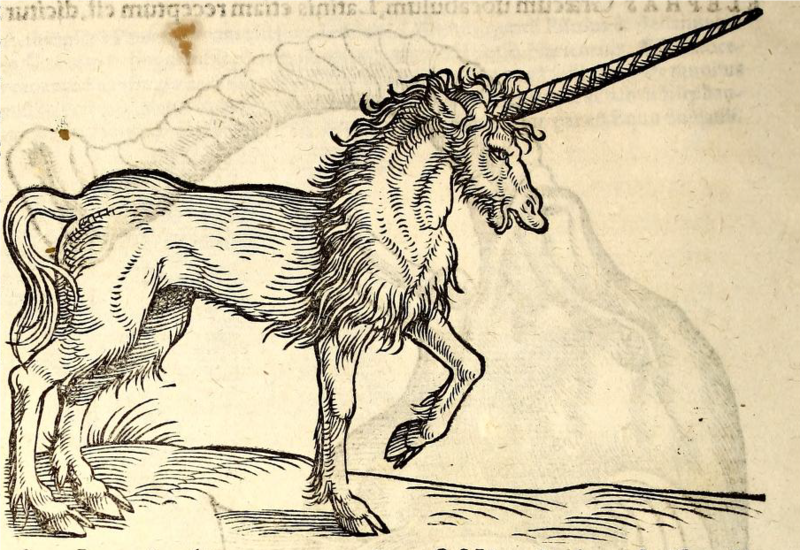 A woodcut of a unicorn from Gessner’s Icones animalium, p. 62. Gessner described this image as “the sort which is generally depicted by artists today” without committing himself to its accuracy. This post was written by James Truitt, intern in the Joseph F. Cullman 3rd Library of Natural History. In August, the National Museum of Natural History opened Narwhal: Revealing an Arctic Legend, an exhibition about the tusked whale monodon monoceros sometimes called the unicorn of the sea. Most of the exhibit focuses on narwhal biology, arctic ecology, and Inuit culture, but one section breaks from the polar theme to explore another legacy of the narwhal—the mythical unicorn. Many tales of one-horned quadrupeds are attested in sources from Europe, the Middle East, and China. In early-modern Europe there was also a brisk trade in unicorn horns, which were believed to have healing properties. As the exhibit points out, many of these likely came from narwhals, which were not well known outside of Northern Europe. In the 1630s Danish professor Ole Wurm put forth a cetacean origin for the horns alongside an early description of monodon monoceros, but belief that unicorns inhabited some part of the earth persisted in Europe into the nineteenth century. While the idea of such an animal may seem ridiculous today, it was accepted by many intelligent people in the past. One of the books in the Cullman Library offers some hints about why. Monodens monoceros on the tile page of The Naturalist’s Library: Whales, written by Robert Hamilton and edited by William Jardine (Edinburgh: W. H. Lizars, 1843). Available on BHL here. That book is Conrad Gessner’s 1560 Icones animalium . . . (Images of Animals), an important work in early-modern European natural history (available from BHL here). The Icones was itself an abridgement of Gessner’s pioneering work Historia animalium, which applied the latest scholarly techniques to describe a variety of animals—including the unicorn, which Gessner called by the Greek equivalent monoceros. 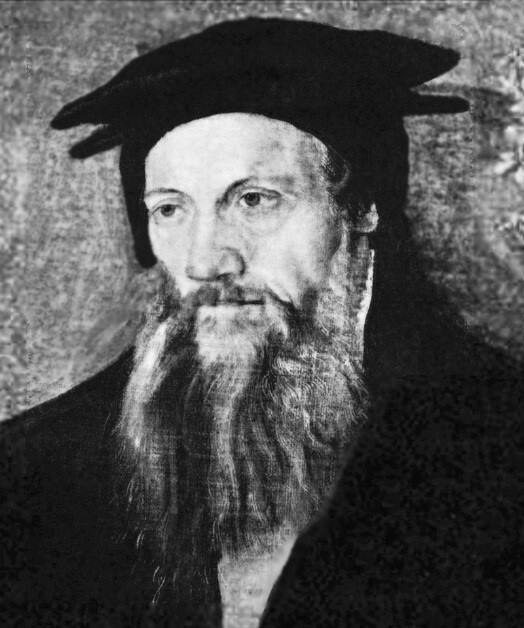 A physician who lived in Zürich, Switzerland, Gessner (1516-1565) was one of the leading scholars of his day. He is best known today for his work in natural history, but he was also one of the founding fathers of bibliography and maintained an interest in alchemy. His writings on the unicorn therefore cannot be dismissed as a fringe view in the mid-sixteenth-century. Portrait of Conrad Gessner by Tobias Stimmer, 1564. However, Gessner’s work with the classical sources was complicated by one fact that they all agreed on: the unicorn was not native to Western Europe. Most sources said it lived in India; some placed it in the Middle East or the extreme eastern edge of Europe. Gessner lived before the period of exploration that began around 1610, and access to specimens of foreign animals would have been the exception rather than the norm, especially outside of the Iberian Peninsula. He therefore had to rely on the writings of travelers who were often not trained in natural history methods, such as Ludovicus Romanus, who claimed to have seen a pair of young unicorns during a visit to Mecca. Horns are often discovered in Poland, and some people contend they are from the unicorn . . . on the grounds that each one is discovered separately, and two at a time has never been heard of, even though they have sometimes been found together with the very skull and the bones of the rest of the body. . . . About five years ago Anton Schneeberger, once a student of mine, now a physician of great learning in eastern Poland, and foremost among thorough investigators of nature, wrote to me with a full and very careful account of this matter after he was allowed to see a number of such horns by means of my dearest friend Georg Joachim Rhaeticus, the most famous physician in eastern Poland at that time and a mathematician unrivalled in our age. “I saw that the first of these horns,” he says, “was the length of my outstretched arms, somewhat ash-gray or black in color, very sharp at the tip, smooth and round. . . . The surface was flat, not turning in a spiral; its substance was crumbly, its shape curved. The inside was a very bright white color which acquired a dusky hue if it soaked up wine. . . . This horn was found under the earth, no deeper than a foot, in a high and solitary place . . . by peasants digging to lay the foundation of a building. . . . In fact, the whole animal was found, and it was larger than a horse, as is easily seen from the size of its bones. Based on the bones of the humeri, tibiae, and ribcage, it is certain that it was a quadruped. . . .” Schneeberger also added that very many things of this sort are found in Poland, and therefore they are practically looked down on. Rhaeticus, a student and close friend of Nicolaus Copernicus, is well known in the history of science for his instrumental role in promoting heliocentrism; he does not seem to have been any more skeptical of the unicorn than Gessner. And why should he have been, when many classical authors and physical artifacts attested to its existence? Narwhal skull from Ole Wurm’s 1655 Museum Wormianum (Lugduni Batavorum: ex officina Elseviriorum,1655), p. 283. Available on BHL here. Of course, the evidentiary standards of the twenty-first century are quite different from those of the sixteenth. 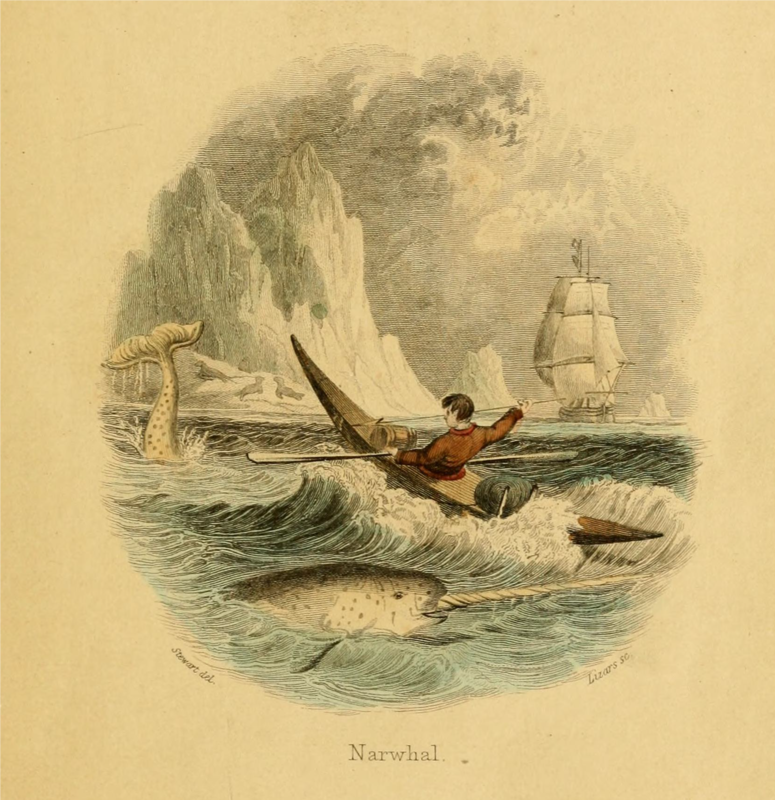 Eyewitness accounts are unreliable, and now we know that many of the horns Gessner described came from narwhals. Despite thorough attempts to show otherwise, today there remains very little evidence for the unicorn’s existence. However, the narwhal’s scientific name, monoceros, is a testament to the lasting influence of the mythical creature. Images of animals that Bernhard von Breydenbach claimed he had encountered on a pilgrimage to Jerusalem. Clockwise from the top left: giraffe, crocodile, unicorn, “name uncertain,” salamander, camel, and goats from India. 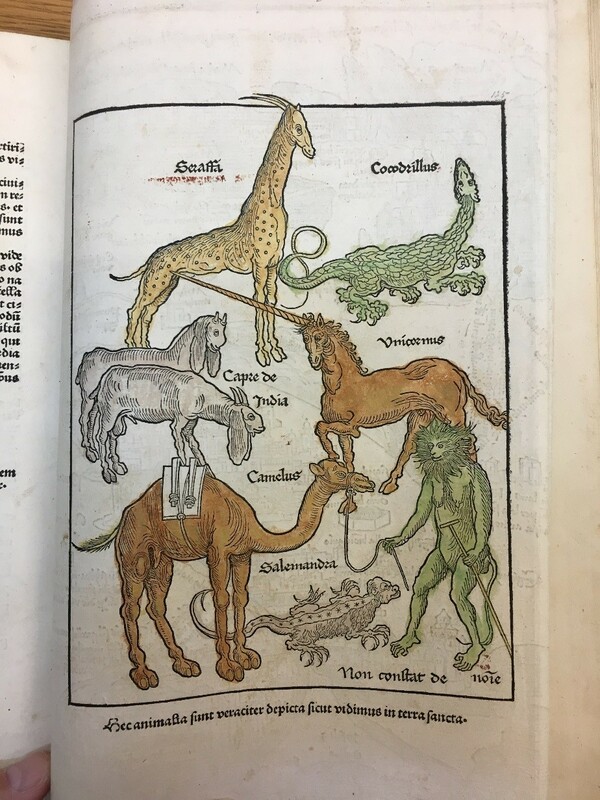 The caption reads: “These animals have been truthfully depicted just as we saw them in the holy land.” From a copy of Bernhard von Breydenbach’s Peregrinatio in terram sanctam (Moguntina: Erhard & Reuwich, 1486) held in the Dibner Library, call number DS104 .B84 1486. Conrad Gessner, Icones animalium . . . (Tiguri: Excudebat C. Froschouerus, anno 1560). Chris Lavers, The Natural History of Unicorns (New York: William Morrow, 2009). Brian W. Ogilvie, The Science of Describing: Natural History in Renaissance Europe (Chicago: University of Chicago Press, 2006), especially pp. 236-240. Edward Topsell, The History of four-footed beasts and serpents… (London: Printed by E. Cotes, for G. Sawbridge [etc. ], 1658). Topsell’s translation of Gessner’s discussion of the unicorn is freely available from BHL here. Richard C. Hoffman, “A Sixteenth-Century Exemplar and Source,” Environmental History 10 (4), 702-704. Hans H. Wellich, Conrad Gessner: a bio-bibliography (London: Society of the British Museum (Natural History), 1975). Lavers, Natural History of the Unicorn, 99-100. Gessner, Icones animalium, 62. For a detailed analysis of Gessner’s approach to his classical sources, see Ogilvie, Science of Describing, 236-238. Ogilvie, Science of Describing, 49, 236. Lavers, Natural History of the Unicorn, 126-127. Gessner, Icones animalium, 62-63 (my translation).